BUS TO MUNICH: Long distance busses are a cheap but bum-numbing option for travelling across Europe. If you’re not booking far ahead enough to get discount train or air fares this could the way to go. European coach companies come under an umbrella organisation called Eurolines. It runs coaches to more than 500 destinations in about 30 countries across Europe including Russia, the UK and Turkey. It’s especially cheap if you grab one of the "Europabus Special" tickets, which mean you might only have to pay €19 one-way Munich to Vienna, €29 to Paris or €39 to London. There are also discount fares on offer for students and seniors. You book online and print out a ticket, very easy, here’s the website www.eurolines.com . (Hauptbahnhof). Pic © digital cat ? If you’re on a whistlestop tour you might like the Eurolines Pass. This is a multi-day ticket that lets you take Euroline buses as much as you want within a 15 or 30 day time span. It's the bus equivalent of Eurorail. Tickets start from €175 for 15 days' travel in the low season, see here for details on that one. Eurolines’ Germany hotline is 069 7903 501. 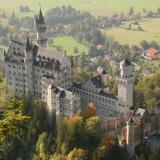 Eurolines is represented by Deutsche Touring in Germany, you can find their website here. Munich has a new long-distance bus station. It’s about 5min west of the Hauptbahnhof (Main Train Station) at Hackerbrücke. Called the ZOB (short for Zentrale Omnibusbahnhof München), it’s a space-age structure with a big, crazy roof. The coach companies have offices on the first floor, click here to go to the ZOB website. 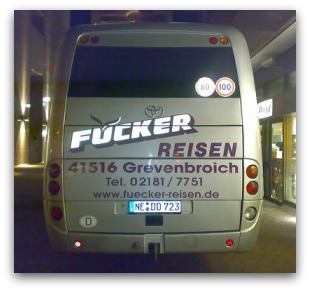 TRANSPORTATION: An oddly named German bus. Sure, the bus isn’t so comfortable - it can be a literal pain in the arse. My first Eurolines experience was a bit of a nightmare - 12 hours overnight to Paris. Couldn’t sleep a wink. But was nice to get to the City of Light at 7am, and after finding my hostel the first thing I did was head up the Eiffel Tower just after sunrise – magic! The last long distance bus to Munich I took was back from Ljubljana in Slovenia. The bus was packed, but at least they showed a film which was easy to follow with the sound turned all the way down – From Dusk Till Dawn. I wonder what the old ladies I was sitting next to thought of the vampire strippers? 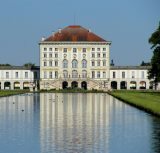 • Find out more practical stuff at Munich Travel Info. • Jump from Bus to Munich to Destination Munich Home.